When I was in Malawi this past summer, a friend told me that a way to improve your confidence is to come up with a couple things a day that you like about yourself. I did this for a couple days and then forgot. (I can’t even remember to water a plant, let alone water my garden of self-perception). But those rare moments siting under a mosquito net and journaling positive things about myself for the first time were really challenging. I wasn’t used to this kind of journaling. I was cleaning out my room last summer and found an old diary from fifth or sixth grade. In it was a grotesque picture I drew of myself with labels to describe everything I considered a flaw. As I grew older, the writing in my diaries matured, but the theme of self-criticism remained. It goes without saying that we usually don’t give ourselves the kind of love and grace that we freely give others. Duh. I talk about it way too much. But I like that I enjoy solving math problems and that I want others to be good at math and maybe even enjoy it with me. 2. I can eat a lot of cheese. Seriously. My boyfriend calls me a mouse. 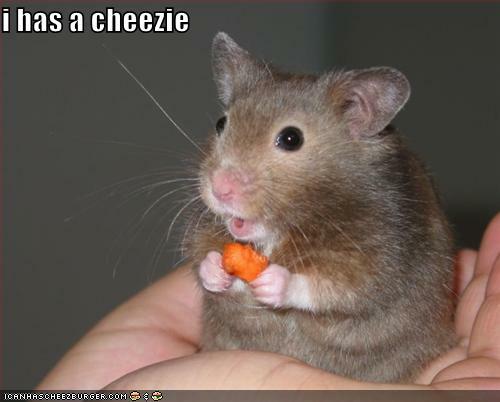 (Mice are cute!) My roommates don’t understand why I need the 2 lb block of Tillamook Cheddar. (Well, maybe Sho does.) Woman’s Health tells me it’s unhealthy to eat in such large quantities. 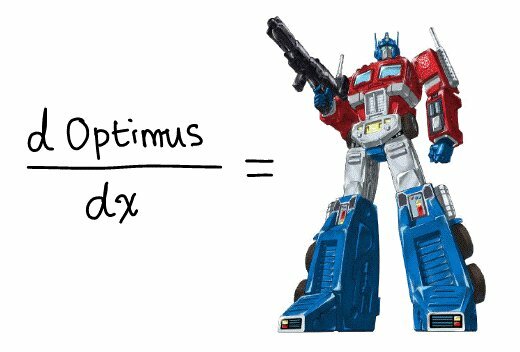 (Hey, I’m proving science wrong! That means I am smart.) And my lactose intolerant stomach thinks I am cruel and unusual. (He’s just gonna have to deal.) In conclusion, I’m awesome. 3. 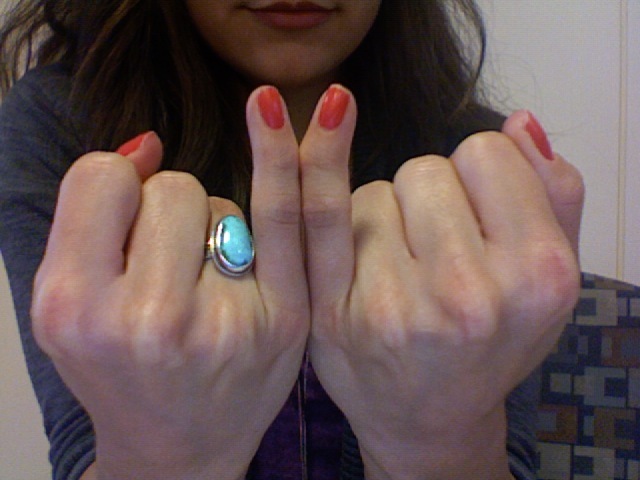 My pinkies are crooked. Yes, some students have told me I am mutated and have requested that I don’t use my pinkies to point to their math work. But, I had a lot of fun as a child convincing people (by “people”, I mean my little brother) that they broke my finger. And now, it reminds me of my mom, who has the same kink in her little fingers. I hope I pass this trait to my daughter (in the future…jeeze, don’t be so presumptuous). 4. I’m a “clean freak”. Stop laughing mom. Things are different in college. 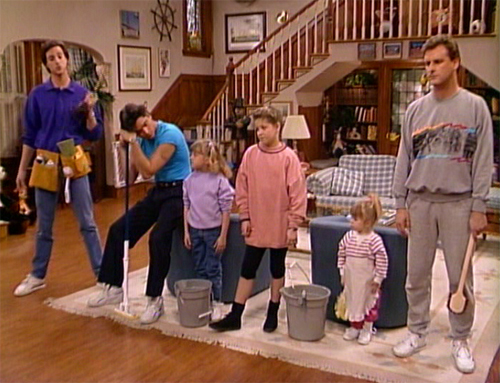 I have grown to be a little bit Danny Tanner sometimes (especially in the kitchen). But rather than feeling bad about this compulsion to unleash Scrubbing Bubbles every time I make a sandwich or pour myself a glass of water, I understand that a clean kitchen makes me happy and I can use this to bless other people (i.e. cleaning up after parties, keeping them from contracting ebola, etc). And so are you! Seriously, you are ridiculously good looking. At UCSD, there has been this underground movement of people posting sticky notes on the mirrors of the girls bathrooms that say “Smile! 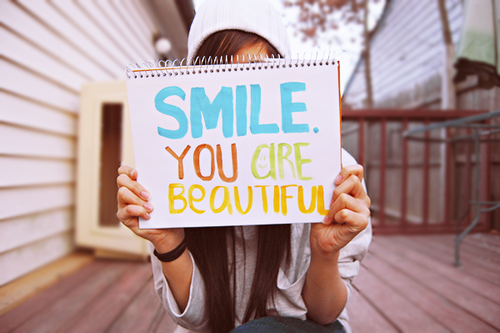 You are Beautiful”. Whenever I see these, they immediately brighten that moment when I am armed to criticize. I actually smile at myself and move on with my day. I wish this was something I could believe all the time everyday, but I don’t. But by making it a practice to be happy with the way I am, I free myself to tell others that they are beautiful. What are your five? And/or do you like cheese? 2. I am very secure in who God has made me. 4. I LOVE animals. A lot. Like, I will rescue any animal that needs a home…and love…and affection. 5. I’m a very hard worker. People can rely on me to get something done, and I love being that for them. P.S. Yes, I do love cheese. 1. I’m easy to please and I appreciate the little things in life, like laughter, peanut butter and jam sandwiches, puffy white clouds in the sky and the smell of jasmine. 2. I love people and even though I talk a lot, I know I have a good heart, no matter the put downs I get at times. I love your sense of humor. I also have crooked pinkies. It is genetic got from my dad, which he got from grandma. I did give this trait to my son. I was thrilled we could share that trait!